The name 'bergheim' means – if I remember my several years of high school and college German correctly – 'mountain home'. 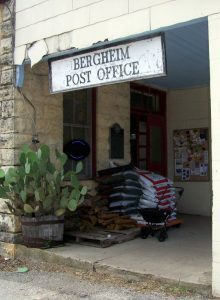 Strictly speaking, although the beating urban heart of Bergheim, Texas, is not anywhere near a mountain that I would recognize as such, (having lived at the foot of the Wasatch Range in Utah, or from living in the foothills of California's San Gabriels) it is pleasingly situated at the top of a substantial rise in the Hill Country, and a pleasant drive north from San Antonio. Especially, if you take 46 to get there; either east from Boerne, or west from Bulverde; the road rambles through rolling country, sparsely scattered with small ranches and housing developments, groves of trees, campgrounds and resorts oriented towards the Guadalupe River. 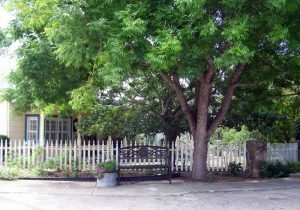 And there, right in the middle of it is the 109-year general store and post-office, housed in a cut-limestone building with a classic 19th-century bedstead front. It is, as nearly as we could see, the only retail outlet on the road, save for a gas station quickie mart and a Subway about a block away at the intersection with FM 3351. Who lives in the area – and there are residents, and visitors who come for tubing and canoeing on the Guadalupe – who want to drive ten or fifteen miles in either direction for a quart or milk, some potatoes, a link of cured sausage, a pair of jeans, a six-pack of beer, some crawfish bait or a pair of pliers, when the sudden need for such arrives in the middle of a busy weekend. Very few people actually do, even in these days of big-box stores and instant-overnight-Fedex delivery. And when that shopping trip meant a couple of hours in a wheezing Model A Ford, or in a horse and buggy ... well, this is why general stores still exist in the wide-open back-country of flyover states like Texas, and why they have come to carry an amazingly eccentric variety of items. Someone once expressed a need for a certain item, the storekeeper stocked it, and other customers purchased it ... and there you go, which is how the owner of the local hardware store explained it to me. Alas, his enterprise is now defunct, having been swamped by suburbia and then put into competition with Lowe's/Home Depot. A pity, because it was one of the few places that you could easily find an expert to explain the finer points of refinishing a bathtub or replacing a garbage disposal. Which is not to say that there aren't experts at Lowe's/Home Despot; they're just much harder to find, especially on holiday weekends. 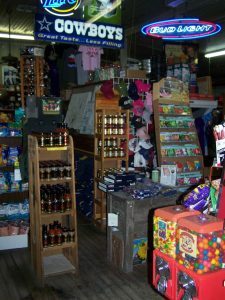 Anyway, the Bergheim General Store is a bit like going back in time to what a general mercantile was, a hundred and more years ago: a little bit of everything, and everything in it's place, everything densely-packed on the shelves, and the aisles narrow, the whole place erratically lit, not a shred of commercial décor save the lighted beer signs and nothing about it reflecting conventional retail wisdom about well-lit, wide aisles and the favored products at eye-level or on the endcaps. Nope: it's where it is at the Bergheim General Store, and efficient use is made of limited space. Four generations of the same family have been in charge of it since 1903. Aside from having electricity and air conditioning introduced sometime in the last 190 years, the inside is pretty much as it was when built: plain narrow-board floors, plain whitewashed/painted stone walls. 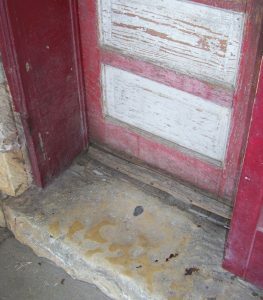 And the front door stoop is of cut stone; over the years, it has worn into a gentle valley in the middle from all the customers coming in and out of the store. I noticed this often in Europe, mostly in places hundreds of years old, or a doorway made of soft stone. This is not something I have seen much in the US, certainly not much in Texas, where there are only a double-handful of stone-built structures older than statehood itself. It's worth a drive into the country to see – that, and what lies inside.